I began Thursday at The Polo Club, expecting to see the Girls' 12 singles. Unfortunately, the matches were put on an hour earlier (it's the only site that has not been doing constant time updates throughout the tournament), and the matches were all fairly quick ones, so I missed them. No. 11 Star Makarome over No. 7 Catherine Bellis did go to 6-7(1),6-3,6-2, and unseeded Valerie Quiceno created another upset with a 6-1,6-3 win over (17-32) Kayla Day. I did make it back to the Girls' 12s in the afternoon to see some impressive doubles for this age group. 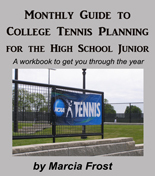 With USTA National Coach Lori McNeil on hand to watch some of what her girls have learned, the No. 6 team of Jada Hart & Maddie Pothoff squeaked by No. 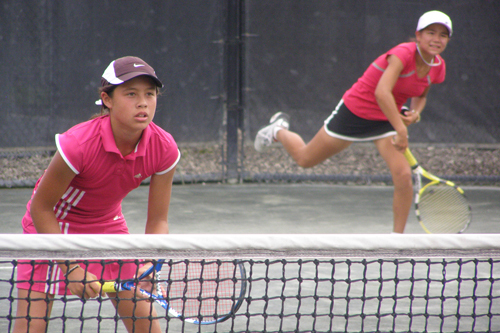 4 Angela Kulkov and Emma Higuchi (above), 6-3,4-6,6-4. 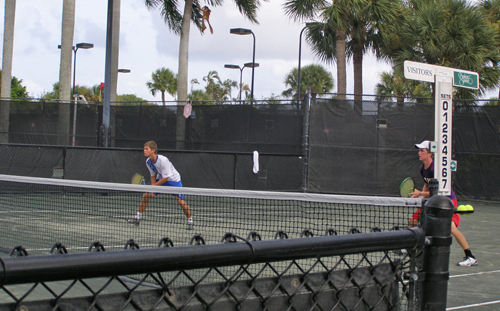 I saw plenty of Boys' 18 singles at the Delray Beach Tennis Center, where the seeds continue to fall. I got there for the start of the second set between doubles partners Bjorn Fratagelo (1) and Nathan Pasha (12). Bjorn had pulled a shutout in the first, but the second was a different story. A large crowd (mostly college coaches) gathered for some exciting points, but it was the top seed who garnered the match with a 7-5 win in the second. 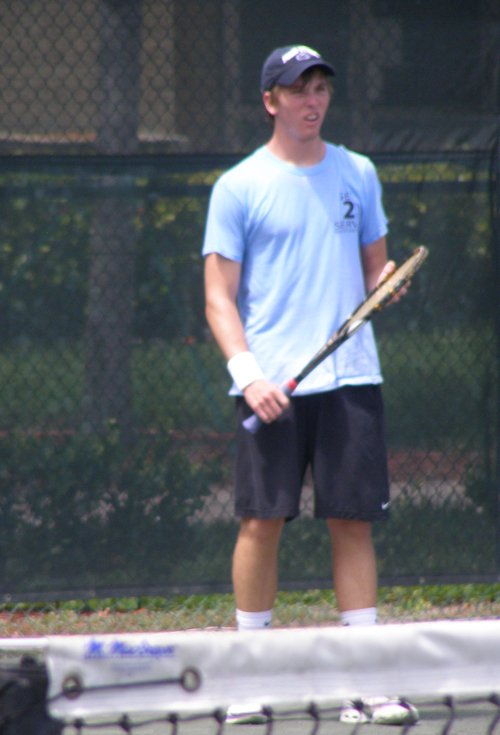 In other Boy's 18 matches, Zachary Krumholz held up through some nice points before bowing out to Daniel McCall (13). Third-seeded Wyatt McCoy finished up over Jose Martinez before I could get over there, but I did catch some of the latest upset by Ross Guignon (above) who survived long points for the win over No. 9 Hunter Callahan. 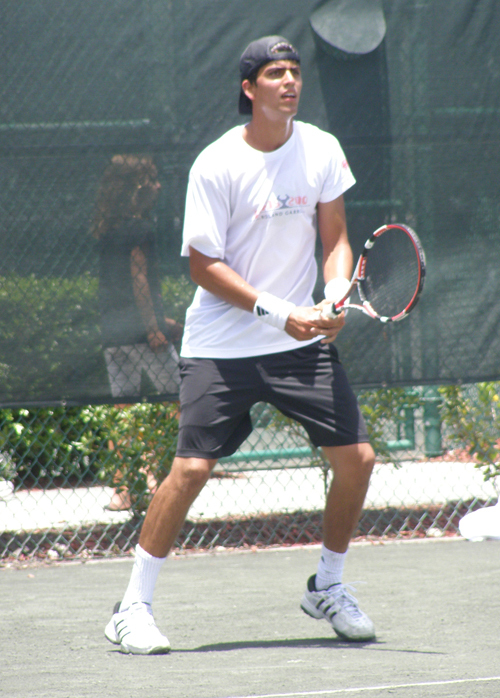 Also falling at the Boys' 18s was Blake Bazarnik (5) to Russell Bader amd Gonzales Austin (4) to Alexios Halebian. 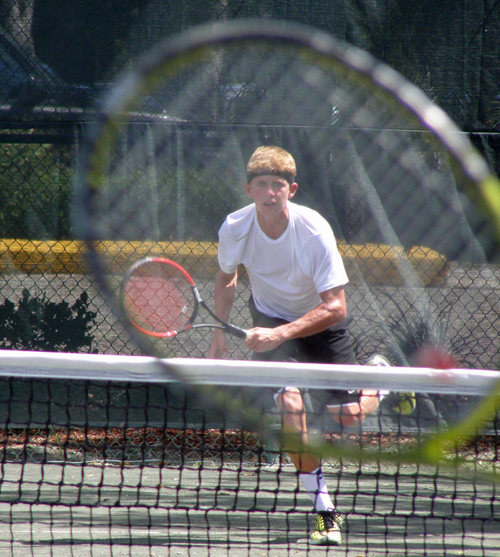 Shane Vinsant (7) survived a challenge from Max Schnur in the second set, as did No. 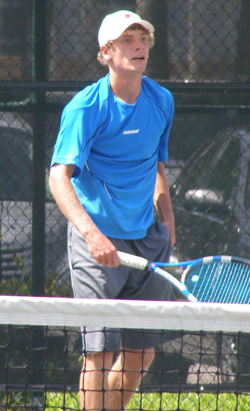 17 Cameron Slverman, the only player in that draw to need three sets, who beat Alexander Robles, 3-6,6-4,6-4. 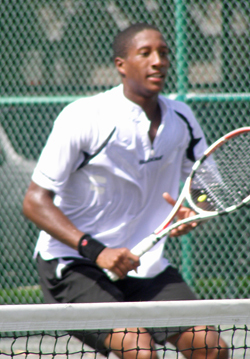 Most of the doubles at the Boys' 18s went the distance, but the top seeds did survive. 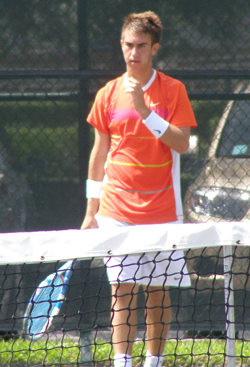 I did not make it to any singles matches at the Boys' 16s, where there was only one three-setter -- Maxx Lipman (3) over Spencer Papa, 7-6,2-6,10-1. The only unseeded player remaining in that draw is Grant Solomon, who Thursday moved on with a win over Quentin Monaghan. 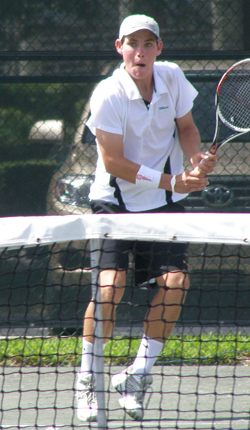 I did see some really great doubles as fifth-seeded Thai Kwiatkowski & Nicholas Naumann beat top-seeded Tyler Gardiner & M. Mackenzie McDonald, 7-6,5-7,10-8. At the same time, No. 3 RJ Del Nunzio & TJ Pura got past No. 9 Jordan Daigle & Trey Daniel (above), 7-5,6-7,10-4, a few courts down. If Tropical Storm Bonnie doesn't wreck havoc with play, I'm planning on heading to the Boys' 14s tomorrow in Fort Lauderdale, where the seeding is holding true (except the third round loss of No. 2 Zandrix Acob), with the one unseeded player -- Alexandru Gozun -- set to face top-seeded Daniel Kerznerman.